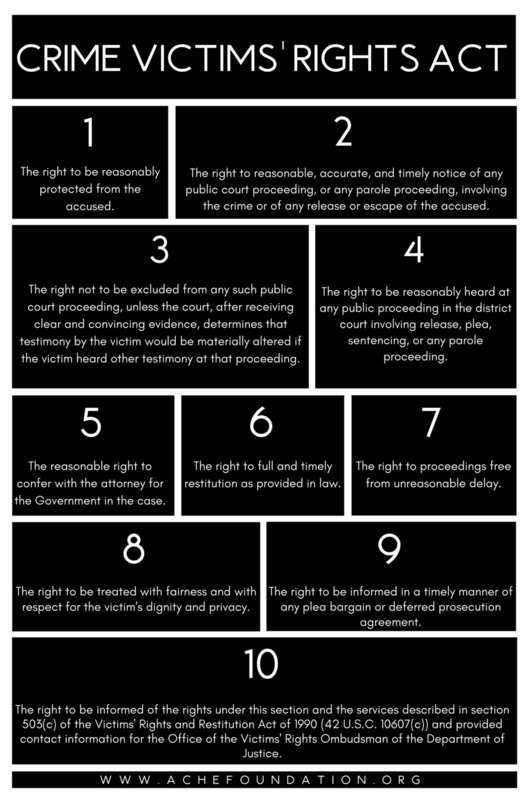 Know Your Rights — A.C.H.E. Enacted in 2004, the Crime Victims' Rights Act gives victims rights in federal criminal cases (18 U.S.C. § 3771). Moreover, the CVRA authorizes program efforts to help victims assert and encourage enforcement of victims' rights, promote compliance with victims' rights, fund grant programs and other activities to implement provisions, and provides an enforcement mechanism for violations of rights in the Act. A joint project of the National Crime Victim Law Institute and the National Women's Law Center; updated by the National District Attorneys Association & National Crime Victim Law Institute in 2016.